For some of the political prisoners held in Burma's wretched jails, the hardest thing to bear is the pain and horror of being physically tortured. For others, held away from fellow inmates, it is the isolation and the creeping sense of despair. Some think about their families, others about the seemingly hopeless cause for which they fought. For the relatives and friends of those incarcerated, there is the struggle of trying to make regular visits and the constant, aching worry as to whether a loved one will ever be freed. Win Tin, a senior colleague of detained opposition leader Aung San Suu Kyi, served more than 19 years in jail � almost all of them in solitary confinement � before being released in 2008. "The hardest thing was the separation from other people," says the lively 80-year-old, speaking from his home in Rangoon. The former journalist was routinely beaten, kept in a dog kennel and on one occasion interrogated for five days straight. And yet it was the separation from other people that he now remembers as causing him the greatest distress. He recalls: "Even when I was in hospital I was put in a different room ... You long to have a discussion with your friends. You feel as if you are losing your mind." Burma's jails are awash with political prisoners. The military authorities that seized power in 1962 dealt harshly with dissidents, but the current junta, which took power in 1988, has jailed increasing numbers of opponents. It has done so when it felt most threatened, most notably after a pro-democracy uprising in 1988 and a democratic election in 1990 � the results of which the junta ignored � and most recently following the so-called Saffron Revolution of September 2007, when tens of thousands of Buddhist monks and demonstrators filled the streets of Burma's cities to demand change. It is impossible to know how many such prisoners are being held, but activists say they currently have details of 2,186. The story of the most famous, Aung San Suu Kyi, the enduring 64-year-old Nobel laureate who has been detained for 14 of the past 20 years, is of course well known. Some have also heard of Min Ko Naing, the "conqueror of kings", a student leader jailed in 1989 for 15 years only to be sentenced to 65 years after being arrested again in 2007. The jailing of U Gambira, a Buddhist monk sentenced to 68 years for helping organise the Saffron Revolution, likewise received considerable coverage. Yet the stories of the vast majority are rarely told. "The number of political prisoners has almost doubled to 2,200 � the highest in the past 20 years � since the uprising of 2007," says Haider Kikabhoy, a Burma expert with Amnesty International. "But behind every prisoner, there's a story � these brave individuals represent a collective struggle for freedom for the people of Myanmar." It was this that motivated James Mackay to embark on the extraordinary, ongoing project that is Even Though I'm Free I am Not. The British activist and documentary photographer has set out to photograph and interview scores of former political prisoners from Burma's jails and, in doing so, draw attention to those still behind bars. "The idea first developed in my mind while I was in Burma working undercover several months after the Saffron Revolution," says Mackay. The results of his work are nothing less than remarkable. Travelling across Asia, the US, Canada, Japan and Europe, as well as having made several secret trips inside Burma, Mackay is steadily putting together a compelling collection of portraits and testimonies from those who have suffered in the as-yet-unrealised struggle for political freedom. Some of the portraits are simple, others more complex as a result of their composition or backdrop, such as that of Phone Myint Tun, who spent four years in Rangoon's deadly Insein jail and who Mackay photographed standing in front of a crowd of activists demonstrating outside the Burmese Embassy in Tokyo, where the former political prisoner now lives. So far he has photographed more than 160 former prisoners. What they all share � and which gives the project its title � is an inability to forget either what happened to them, or what is currently happening to those still in jail. To highlight this, Mackay chooses to photograph each of his subjects holding up their right hand and showing their palm � a gesture known in Buddhism as the Abhaya Mudra and done to symbolise fearlessness. On the palm of their hand, each of Mackay's subjects writes the name of a prisoner still being held. One of the most powerful images � and one which the junta will find incendiary � is that of Win Tin holding up his palm on which has been carefully inscribed the name of Aung San Suu Kyi. 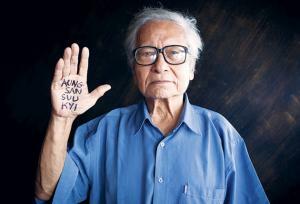 The slightly-built, grey-haired man is well aware of the danger he is in for allowing such a photograph to be taken, yet despite spending almost two decades in jail, Win Tin remains the most outspoken critic of the government still at large in Burma. He says he is constantly followed by informers and government agents. For Mackay, slipping into Burma, taking that photograph and evading the security authorities is the high-mark of his career to date. I first encountered Mackay in January 2009. I was at Bangkok's main bus station catching a ride up to Mae Sot, a town on the border with Burma which has become a centre for many exiled Burmese and activists. It is also the location of many of the refugee camps in which 160,000 Burmese now live. I was going to one of the camps to interview elderly ethnic Karen refugees who had fought for the British against Japan. Initially, I assumed the tall Westerner asleep in the seat next to mine was a backpacker. But on the eight-hour journey up to Mae Sot, stopping off at a roadside canteen to eat bowls of noodle soup, he detailed his activist work, as well as his efforts to photograph former prisoners. "The former prisoners have suffered unimaginably horrendous experiences in jail in Burma, yet their resolve, their will and their beliefs cannot be broken no matter what has been thrown at them or is currently being thrown at their colleagues in jail right now," says Mackay. "My inspiration for much of what I now do in my life comes from meeting each and every one of them." Among the former prisoners he has photographed is Khun Saing, a 59-year-old who now lives in Sheffield, having fled from Burma in 2006 and secured asylum. A former medical student, Khun Saing was jailed on three different occasions for his political activism, serving a total of 13 years. Working in a bakery to support himself, he is still waiting for his wife (who he met and married in a refugee camp in Thailand) and child to join him. Recalling his seizure, he says, "At the time I was arrested and interrogated I was tortured. That period was very hard. I had to answer so many questions. The problem was that if I said the wrong thing my colleagues on the outside would be in danger. Also, some of the torture was so painful. It's not so much about the pain but some of it was very degrading and inhumane." Khun Saing says he eventually left Burma at the pleading of his mother, who had struggled to visit him every month in jail. (It is common practice for the Burmese authorities to hold political prisoners in jails far from their homes, making it harder for relatives to visit.) "She said if you cannot stay away from politics, please leave the country. I will at least have peace of mind." Bo Kyi, another former prisoner who now lives in Thailand, was jailed twice � firstly for demonstrating for the release of jailed students and the second time after he refused the junta's "offer" to become an informer. He remembers being shackled in chains. The guards then ordered him to exercise. Barely able to move, he was then beaten for failing to perform their demands. Jailed for a total of seven years, Bo Kyi taught himself to speak and write English, hiding his furtively secured paper and pencil from the guards. After escaping to Thailand, he now runs the Assistance Association of Political Prisoners, which helps those who have served time in jail and campaigns for those still behind bars. He remains insistent that Burma cannot have a peaceful future until those prisoners have secured their freedom. He says an election planned for later this year and condemned by campaigners as simply a means of further cementing the military's position will not help. "The election has no credibility without Aung San Suu Kyi and the release of all the political prisoners," he says. "The people in Burma want to choose their own leaders." The junta has tried to pitch the election to the international community as a step on the path towards full democracy. But the National League for Democracy (NLD), the main opposition party headed by Aung San Suu Kyi and of which Win Tin is a senior leader, has decided to boycott the polls. There is mounting consensus that no fair election can take place with so many prisoners remaining behind bars. One of those still in jail is Win Htein. An NLD leader, the 70-year-old was first jailed in 1996 for speaking out against torture to foreign journalists. He was released in September 2008, on the same day that Win Tin and six other prisoners were set free. Yet just one day later, Win Htein was re-arrested and taken back to jail. His son, Hsan Htein, who lives in California, believes his father's mistake was to speak to a dissident radio station about the conditions in prison. Speaking from San Francisco, Hsan Htein, who himself fled Burma more than a decade ago at the insistence of his mother, said his father was being held in Katha jail, hundreds of miles from the family home in Rangoon. Every month, his 59-year-old mother, who is not in good health, embarks on a 24-hour journey each way using train, boat and bus, to visit. Hsan Htein communicates with his father by letter, though they are not able to talk about the conditions in prison. "He is quite aware of what is happening around Burma," he says of his father. "He is getting the news." As to the future, Hsan Htein can simply hope against the odds that something will bring about a change in Burma, something that will secure his father's freedom. For all of the country's political prisoners, someone, somewhere is wishing for the same.